You can access this feature by selecting the embed tab from the main menu on your dashboard. To include the form in your website, you need to copy and paste the code directly into where you want the form on your website. 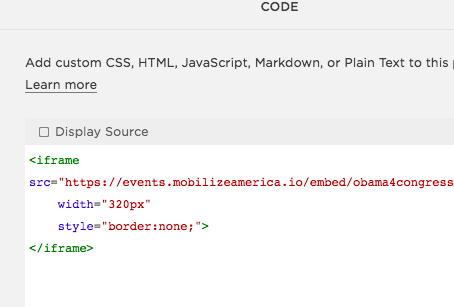 If you are using Squarespace that means editing the page and selecting the "code" block, from the "add block" menu, then pasting the code from your dashboard into the block. 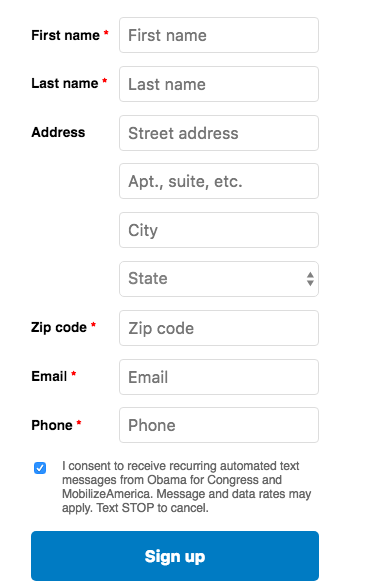 If you would like to add an Activist Code or a Survey Question, you should create the desired Activist Code or Survey in VAN and add it to your Hot Leads form in the VAN settings tab of your Dashboard. Many campaigns choose to mark that a volunteer signed up through MobilizeAmerica. You can troubleshoot by adding a height=650px between the width and style sections. 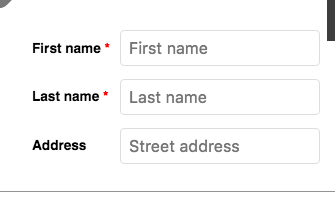 Making this edit in the code will change your form to appear with all the fields.